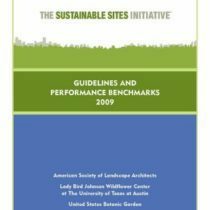 The Sustainable Site Initiative is an interdisciplinary partnership working to foster a transformation in land development and management practices. Charles – you obviously have not read SITES closely or either don’t understand it. It is a performance base metric – the opposite of prescriptive design. Also, I challenge you to certify a project. In my work, I have found that those who believe they have been “doing it for 40 years” have great difficulty meeting the minimum criteria. Hi Heather – definitely disappointing to see. Just saw the announcements; have read both press statements that describe very different points of view. What do you think the key disagreement is and what will take to resolve? A large number of credits under the Sustainable Sites Initiative pertain to vegetation. Check out my latest article “Green Math” in Landscape Architecture Magazine to find out what you should know to earn as many as possible. Land8 online has invited me to provide a free webinar on sustainable sites, small scale sites and residential landscapes on November 7th. What type of information you would find most useful? LAbash (landscape architecture bash) is a student run conference that serves as a platform for students from various universities to converge, exchange ideas and celebrate their passion for landscape architecture. Early registration for FIU LABASH 2012 has been extended for 1 week, don’t miss out register today! Need more reasons to attend? Now you have the opportunity!